This tutorial was inspired by one of our customers that wanted to have some summer fun with his son. Basically he wanted to use a remote clicker to sound a car horn. 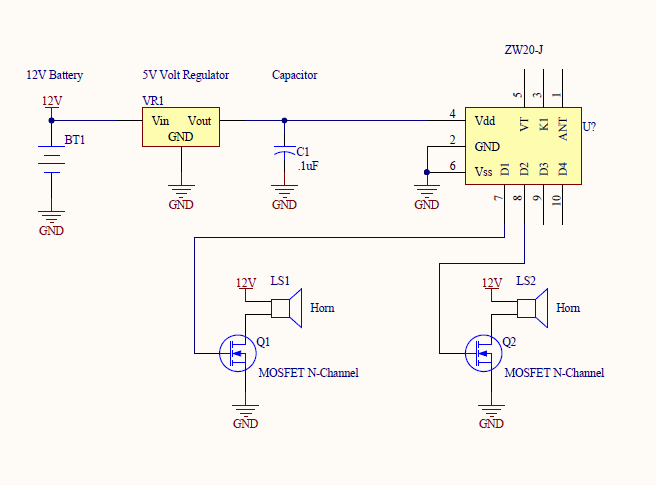 The receiver and the horns both work at different voltages, 12V for the horns and 5V for the receiver. As we are going to power the circuit with 12V the horns are covered so we will use a regulator to get 5V for the receiver. We will use the common 5V regulator along with some capacitors. In order to sound the horn we will need to use a pair of MOSFETs, these will enable the small receiver to turn the horns on when a button is pressed. The circuit is actually very simple, I will describe the components and their connections starting from the top left. For the battery you could use any 12v lead acid battery, 11.1V LiPo, or a 12V power supply. Bear in mind that the horns can draw a lot of power so if you use a 12V power supply ensure that it can supply at least 4A. The positive or red terminal is connected to the voltage regulator and the two positive terminals on the horns. The negative or black terminal gets connected to all the points marked as GND or ground. For reference these are the pins of the LM7805 voltage regulator, that we sell, top view (body facing up, metal part at the back). The 12V supply gets connected to ‘INPUT’ the ‘COMMON’ terminal is connected to ground and the ‘OUTPUT’ terminal is connected to the capacitor and the ZW20-J receiver. 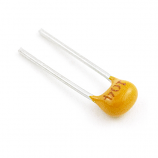 The capacitor that is used is a ceramic capacitor and as such it does not have a positive or negative side. 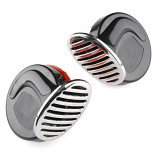 It does not matter which lead is connected to ground or the output of the voltage regulator. The ZW20-J receiver is very simple to connect – however out of the box it is not trained to any remote. The simplest way to connect it is as shown with power going to pin 4 and ground going to pins 2 and 6. 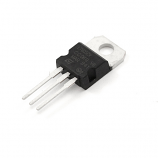 A MOSFET allows you to control high powered devices from a low powered device like a micro-controller or in this case the receiver. 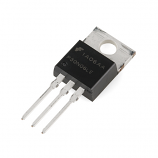 We are using what is called a N-Channel MOSFET. The MOSFET acts like a switch and when voltage is applied to the ‘GATE’ pin current will flow through the horn to the ‘DRAIN’ pin and out to ground which is the ‘SOURCE’ pin. As you can see in the circuit, we have connected 2 MOSFETS to the outputs of D1 and D2 on the receiver. These pins correspond to the first and second button on the remote control. If you want to control more items, like a light, you can wire up the D3 and D4 pins. The horns are pretty simple – one connection goes to the 12V battery and the other pin to the ‘DRAIN’ pin of a MOSFET. Next post: The first in an onoing series about a guy who has no idea what he’s doing here, but really wants to.